According to a report from marketing researcher Newzoo, esports revenues are predicted to hit $905 million by the end of 2018, a huge 38% increase on the previous year. With millions (if not billions) of monthly gaming streams on sites such as YouTube and Twitch, esports is a hot topic in the digital world right now. But esports is not only about competing online. Physical esports tournaments are drawing huge international crowds who want to watch the best ‘gamers’ in the world battle it out live. With $1m prize pools commonplace, its no wonder that the esports event industry is attracting interest from Fortune 500s who have previously had no affinity with the space. With live esports tournaments on the rise, organizers are looking to innovative technologies and industry best practices to help deliver safe, memorable and profitable events for their fans. One answer: RFID credential technology. The use of RFID technology is already popular at large music festivals, conventions and water parks but it’s relatively unused in the esports events industry. Here are a number of ways RFID technology can be used to benefit esports events. Sponsorship is a big driving force behind esports because of the revenue it delivers. It’s forecast to contribute 40% of esports revenues in 2018. And for an industry looking to bolster additional revenue streams, RFID wristbands offer a great solution for a seamless brand experience, that sponsors will love. Sponsor’s no longer have to guess how well activations were received. Tangible data can be monitored from a tap of a wristband. Your fans won’t feel like they’re being sold to, and your sponsors can get actionable, deep data. While organisers can understand the real value and potential revenues generated from future activations. You can never collect enough data when you’re an event organiser. It all goes towards improving the experience for fans, identifying opportunities for growth, and tightening up security. With RFID technology, organisers and sponsors can see real-time analytics on various engagement and operational aspects of an event. Foot flow, capacity levels, popular areas, merch sales, popular activations, food and drink sales… and anything else you decide to power with RFID wristbands. This invaluable data will help esports event organisers improve key operational aspects and identify new revenue-generating opportunities. Access control for any large event is extremely important. You want it to be quick, and you want it to be safe. With esports events such as BlizzCon, League of Legends, and Dota 2 attracting crowds in the tens of thousands, RFID technology is ideally suited to controlling access. 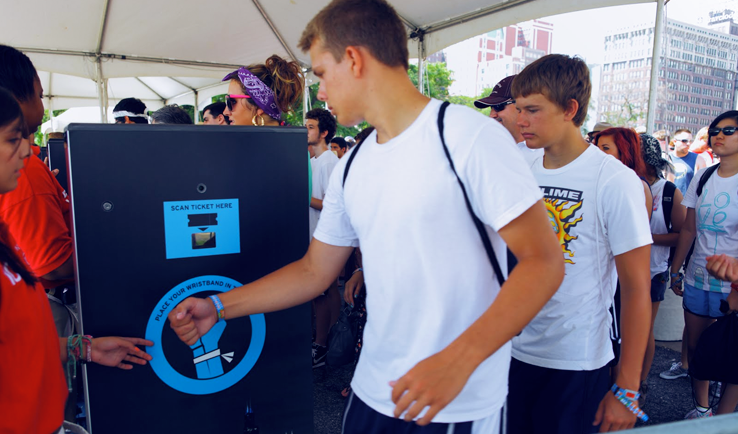 RFID technology enables unparalleled security, completely eradicating fraudulent entry and preventing wristband or badge pass-backs. Using RFID credentials, attendees can quickly tap their badge or wristband against a scanner to access an event. There’s no need for barcodes or printed tickets, which can be around 10x slower than RFID scanners. And if guests do lose their RFID pass, you can quickly deactivate it and issue a new one, on the fly. When guests link their social media accounts with their RFID credential it opens countless opportunities for fan-engagement during an event. Special offers, gamification, social check-ins, and photo-opps can all be done with a quick tap of an RFID badge. These activations can extend the reach of your esports event to brand new online audiences. And, help attract headline sponsor revenue. And why not reward attendees with a loyalty programme that can be unlocked with their RFID wristband – for example, offering a first look at a new game or the ability to play a new level before it’s publicly released. RFID systems can enable ticketholders to link their RFID badge or wristband to a method of payment. Whether offering a pre-load or tokenised payment system or linking directly to a bank card, cashless transactions are proven to increase per head spend by up to 30%. RFID cashless payments also provide efficiencies for event food, beverage and merch operations. Fans no longer have to carry wallets, tickets, and personal information just to participate. Ticket-holders can enjoy the show with a feeling of freedom that their credential is conveniently linked to their payment source, enabling fast and simple purchases with a tap of their wristband or badge. 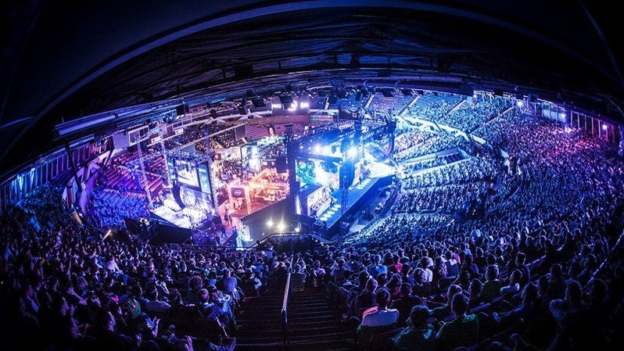 Esports teams, players and fans are typically more tech-savvy than the average event attendee. This means that there will be less friction with the adoption of new event technologies like RFID. Quick adoption enables organizers to push the boundaries with technology whether its offering cutting-edge security, instant transactions or working with agencies to develop meaningful brand activations. As far back as 2011, ID&C was leading the way in RFID technology for live gaming events. 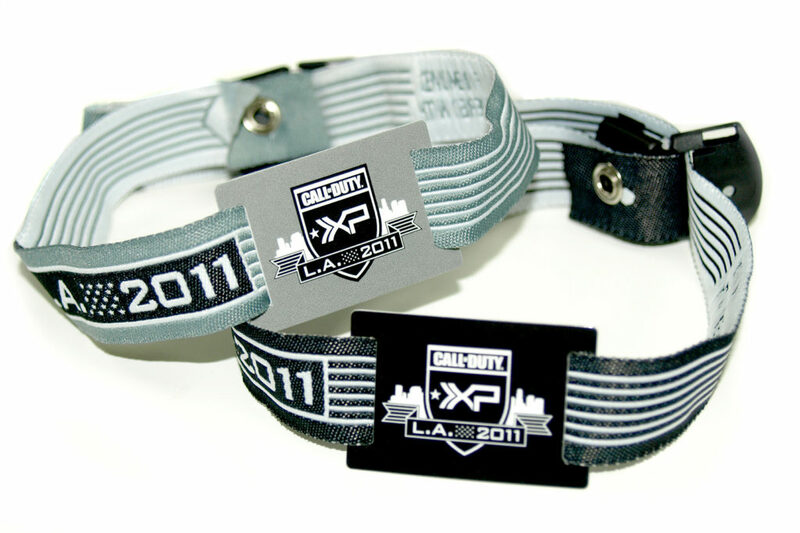 Our RFID wristbands were custom designed for the Call of Duty XP event in L.A. 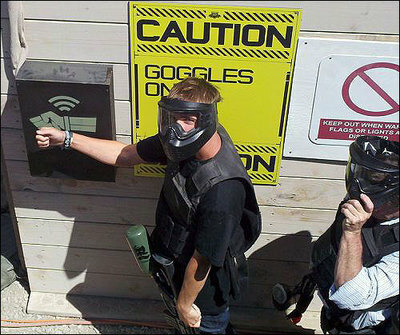 The social gaming event saw thousands of COD fans play the game in a real-life environment (fake guns of course) and during the simulated war-zone, fans could use their wristbands, fitted with RFID chips to post their scores and photos direct to Facebook. This kind of social interaction added value to the event and allowed marketers to measure ROI on new levels thanks to Facebook’s ever-updating analytics. Now, ID&C providers RFID-enabled credentials to many of the world’s largest Esports tournaments and pop-Conventions, delivering best-in-class service and quality in partnership with leading RFID system providers. Contact us if you would like to learn more about using RFID for your esports event. This entry was posted in Ideas, RFID on September 21, 2018 by idandc.